Taking a triple container on the left hand side of the Cargo development at Wapping Wharf, Pigsty opened its doors to the public on October 21st this year. 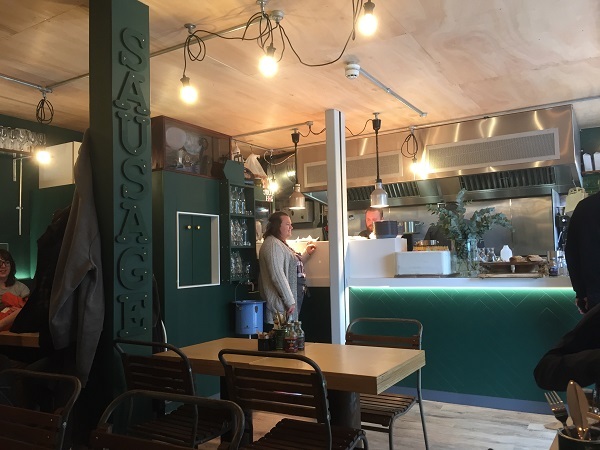 This restaurant – a celebration of all things pork – is the first for the team behind Bristol-based The Jolly Hog, founded by former Harlequins player and Welsh rugby international Olly Kohn and his two brothers, along with Quins and England player Will Collier. The Jolly Hog began with a very old-fashioned-looking sausage maker bought for Olly by his wife, which can be seen in a case perched up high to the left of the restaurant’s counter. It’s one of many items that you’ll find displayed around the beautifully-designed restaurant: huge letters spelling out SAUSAGE, displays of the drinks that are on offer and the story behind the business inscribed on one wall are just some of the little touches that give Pigsty a personality all of its own. The team really have made incredible use of the space, too. It’s cosy without being cramped – while you’re guaranteed never to be sitting too far from other diners, it has a welcoming feel and a sense of space that is increased by the mirrors running right round the middle of the walls of the dining area. They’ve even managed to cram extra storage space into the seats, which have hinged lids – the place has been very well thought out indeed. Diners are seated at a table either inside or out when they arrive, and are given their table number and presented with menus on clipboards, which they take to the counter to place their order. There’s a tap, jugs and glasses by the counter so you can help yourself to water, while each table is adorned with cutlery, napkins and condiments to enjoy with your meal. 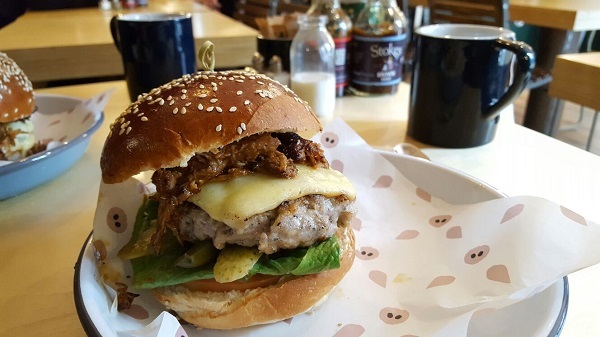 Covering breakfast, lunch and dinner, the Pigsty menu features an array of porky delights, with all of their meat sourced from high animal welfare farms, and from as locally as possible without compromising on quality. Both the breakfast and the lunch/dinner menus are relatively small, but there’s something for everyone – including vegetarians. While we were almost swayed by the Pig Board (basically a taster of various elements of the menu – next time…), we both decided to go for the Pig Mac (pulled pork, a pork patty, baconaise and cheese in a brioche bun – £8), and shared a side of the skin-on chips with rosemary salt (£3.50). Despite their Leaning Tower of Pisa appearance, the brioche buns were firm and sweet and held together well. 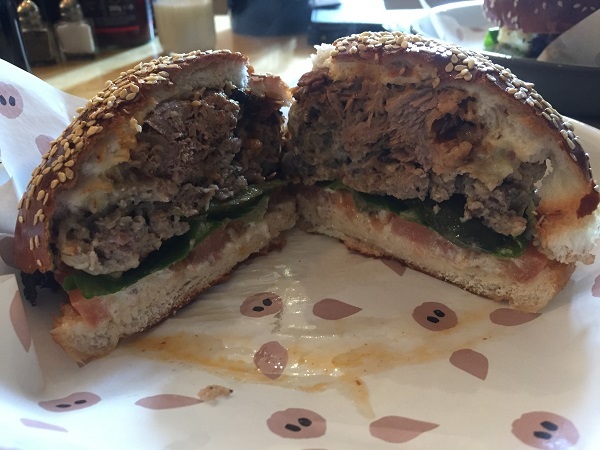 We were big fans of the meltingly tender BBQ pulled pork, which wasn’t cloyingly sweet like some has a tendency to be, and the pork patty was beautifully seasoned and juicy, but disintegrated very easily (we were glad of the extra napkins!) The baconaise added an extra layer of porkiness and a change of texture, while the inclusion of lettuce, a thick slice of tomato and sliced gherkins added a freshness that stopped the über-meatiness from being too much. 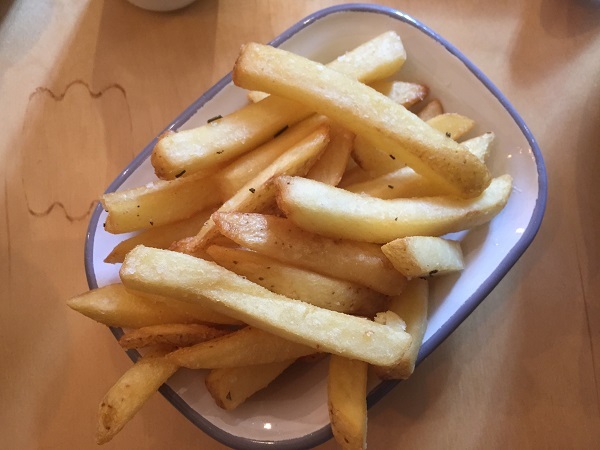 The chips were tasty enough, with the skins left on and the perfect fluffy to crunchy ratio, but we felt that the advertised rosemary flavour could have been far stronger. Throughout our meal, all of the Pigsty staff were happy and friendly, and despite how busy they were and how little space they have, we never felt that we were being rushed through our meal. 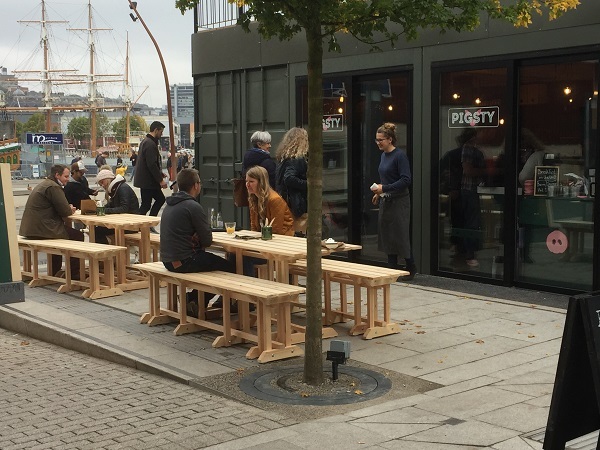 We’ll definitely be heading back soon to try more of the menu – and we love the fact that Pigsty and the other Cargo traders are just a few minutes’ walk from our doorstep!